In this category, you have the power to change what template your website uses, what colours (the default text, headings, background, etc.) are used on your website, and what logo you want displayed for your company. 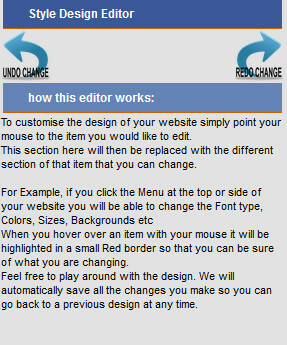 To customize the design of your website simply point and click your mouse to the item you would like to edit. The right side editor tools will slide out with the different properties to change on that item. 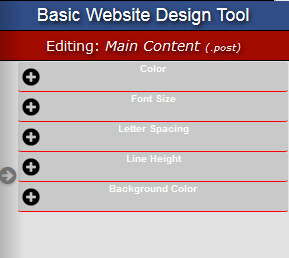 For Example, if you click the Menu at the top or side of your website you will be able to change the Font type, Colors, Sizes, Backgrounds etc. When you click on an item, that item will have a highlighted red border, so that you can be sure of what you are changing. The intermediate design tool is very similar to the Basic design tool but it has a bit more functionality, for instance we have added a 'Undo and Redo' button to quickly go back to your previous settings. You can also change more items in regards to the Background Colours in different sections etc. This option allows you to customize your site by changing the Cascading Style Sheets. 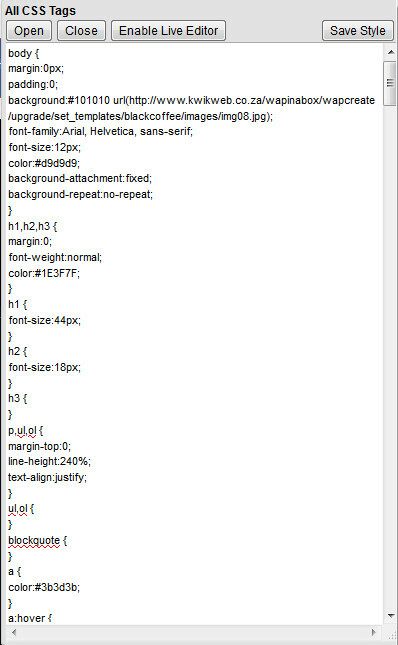 Please make sure you have a good understanding of how CSS works before attempting this feature. 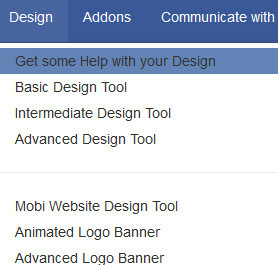 From here you can Customize the Colors, Upload your Logo etc. By default this option is limited in comparison to the previously mentioned editors for the simple reason that Mobile sites need to have only the basic information available in order for your visitors to have a good browsing experience.